We don't necessarily want "conneted cars" due to privacy issues of tracking all vehicles. This is a wolf in sheep's clothing. Wipers are on manual switches in the first place. They do not come on automatically. You must TURN them on with a rotary switch with several stops for varying speeds to the driver's taste. Some drivers run full out all the time even in a slow drizzle, and some run intermittent in drizzles, or faster intermittents in case the window is dirty...all to driver's taste. That said, I would strongly suspect any data like this collected, not to mention preponderance of data would be in high population concentration areas which would skew the data toward 'more rain' in the towns and cities. In addition, this piece comes from Univ of Mich., a known producer of covert citizen data collection schemes to spy on citizens. Who knows the real purpose. Coupled with other 'shared data', this could uniquely track visits to stores, doctors, specialists...or bars or cathouses and casinos. Employers, insurances, gov't investigators, others would love this. Both of those above comments being true notwithstanding, privacy and backdooring, that sort of data is going to be available anyway through smart cars. Think about how many systems will be talking to each other constantly. You'll probably need to flash an ID or a credit card or have an app account to use them or register them in the first place, and they will be constantly swapping data with every other vehicle on the road (after the bulk of those are also smart cars). 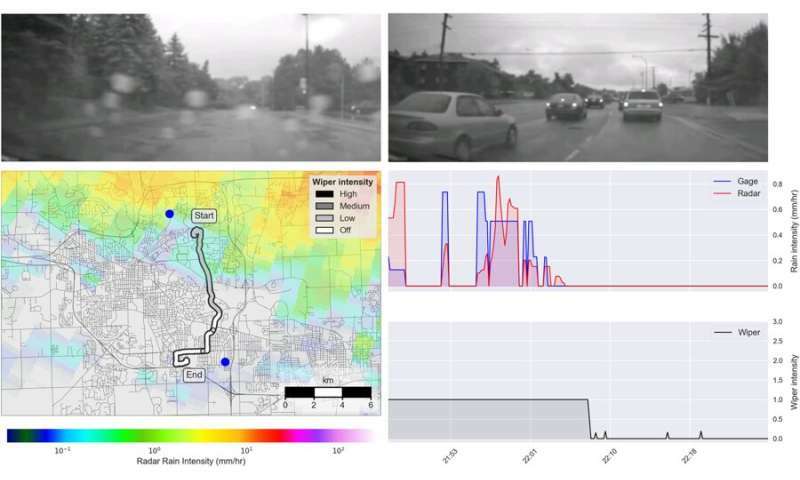 Even if this sort of data monitoring isn't forced into private vehicles (if we still get to have private vehicles) it is logical to put it in every public vehicle on the road, since those will be tracked constantly anyway. Busses, taxis, trains, power poles, sewer systems, everywhere will be full of sensors for this kind of real time real location weather data. Privacy on the roads is already pretty nonexistent. They know where you are at all times if your phone is on, gps is on, satellite radio is on, etc.